Aaron McGruder is a famous Artist from USA, he is 44 years old and still alive, born May 29, 1974. 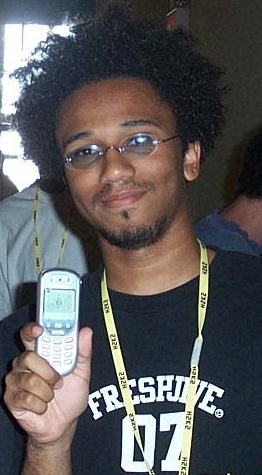 Aaron McGruder, born in Chicago, Illinois, is an American comic creator and author of the comedy series "Boondocks" ("Bystan"). He is born under the zodiac gemini, who is known for Communication, Indecision, Inquisitive, Intelligent, Changeable. Our collection contains 15 quotes who is written / told by Aaron. "Once you give up rights, they're not going to give them back"
"And I'm not so in love with making people mad that I want to live my life around it"
"I want the news delivered unbiased. I thought that was the whole point with journalism"
"When the news wants to tell you something is important, they put dramatic theme music behind it. They scare you into watching the story"
"There's some new evidence that has just come out about the CIA planning terrorist attacks on U.S. soil in the '60s and how they were going to set up Castro for it in order to get America behind a war in Cuba"
"Anyone with a gun can go out and commit an act of terrorism, even without a political affiliation"
"You know, every time a summer movie comes out, people think they're gonna get rich off of the merchandise"
"We have, essentially, a worthless democracy"
"One, I push my deadlines closer than anybody else, or let's say it this way: I'm really late"
"I don't want the news to be patriotic. I don't want to see flags on the lapels of the anchors. I don't want any of that"
"The American people have no control over what the military does. We have no say in American foreign policy"
"I cannot be made into the commentator for the unspoken black masses"
"You know, Democratic and Republican administrations alike have supported individuals and regimes that have slaughtered millions across the globe. And they need to be held accountable for that"
"We have to confront the very scary fact that the president is a moron. He's really dumb"